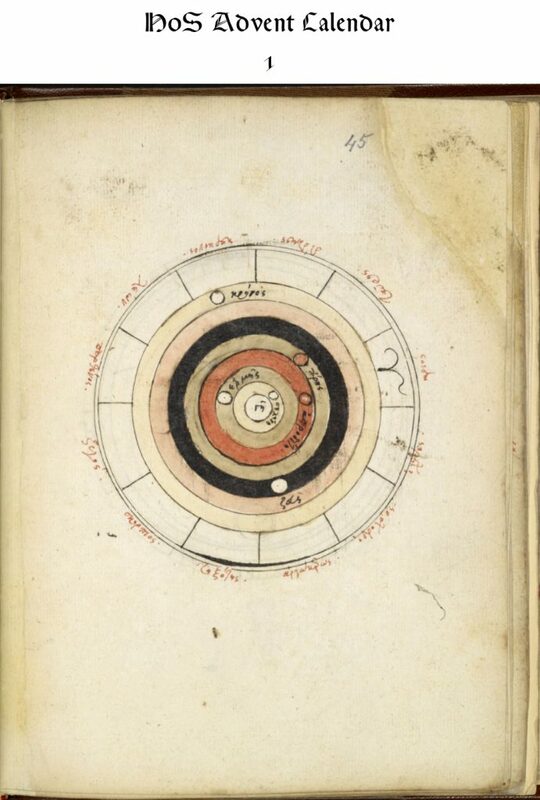 A diagram showing the nature of the cosmos from earth at the center to God at the top, passing through the various levels‚—e.g., the elements, ether, angles—from a 16th-century copy of Nicephorus Blemmydes’ “Epitome physica” Oxford, Bodleain Barocci 94, fol. 27v. This diagram showing the structure of the cosmos comes from Nicephorus Blemmydes’ “Epitome physica.” At the center is the sphere of elemental earth surrounded by a narrow sphere of water. Then a broad sphere of air surrounds them capped by the sphere of fire. Separating the elements from the heaves is the sphere of the moon. Beyond that is the ether, the “ΑΙΘΗΡ,” where we see planets and stars. Beyond this is the “Water beyond the heavens” surrounded by the “Place of the angels.” A hierarchy of nine levels of angels, archangels, and beyond culminates in the Trinity at the top. Born just before the Latins sacked Constantinople in 1204, Blemmydes fled the capital and studied mathematics, medicine, astronomy, logic, as well as theology and rhetoric in Asia Minor, especially Nicaea. He participated in the controversies between the Eastern and Western Churches, agreeing with the Western Church’s beliefs on such issues as the procession of the Holy Ghost from the Father through the Son. He was also renowned for establishing a school, where the young George Akropolites studied. Like so many Byzantine polymaths, he ultimately retired from public life to a monastery he had built. A 16th-century copy of a Byzantine diagram of the geocentric cosmos from Royal MS 16 C XII, fol. 45r. 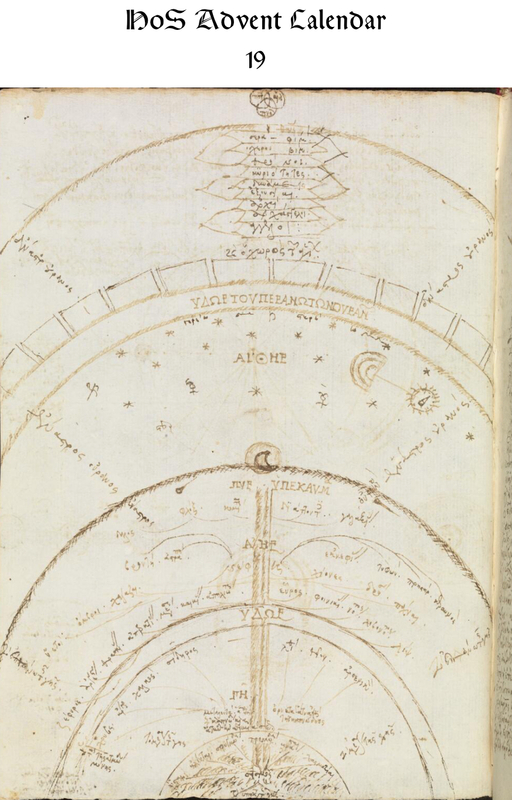 This diagram is part of a collection of astronomical diagrams in Royal MS 16 C XII, a latter 16th-century manuscript first owned by the brilliant classical scholar and historian Isaac Casaubon. 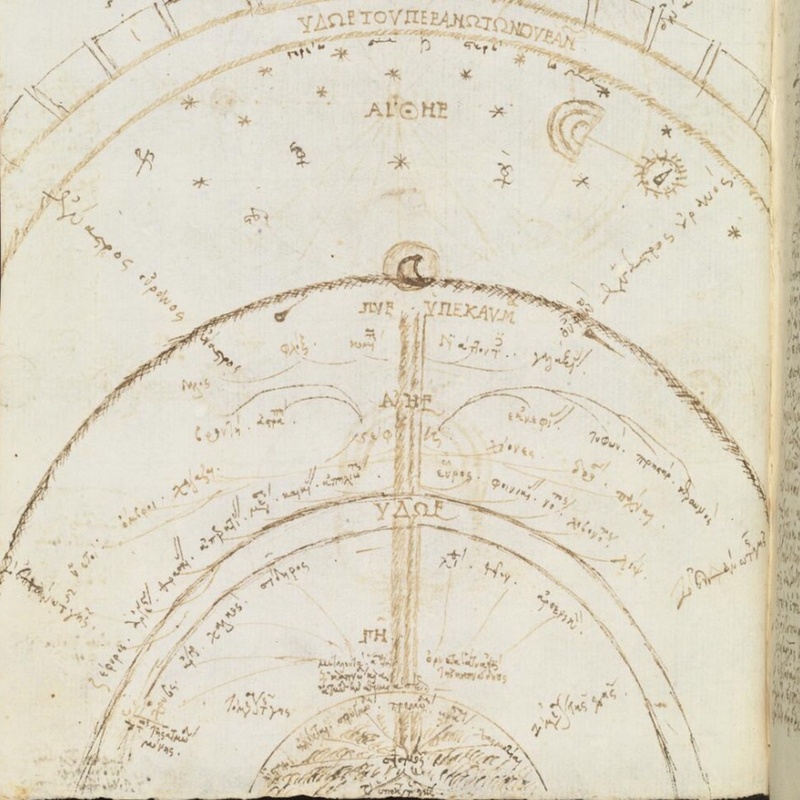 Other texts in the in the codex all concern the construction and use of the astrolabe (the first text is a printed edition from 1544, the rest are manuscripts). If we inveigh against people who distort science and ignore facts to prove their point and we label them dogmatic knuckleheads, we should at least guard against committing the same missteps in our criticisms of them. I have no doubt that this latest piece of quasi-scientific claptrap is rubbish, but getting the history wrong—or, to put it more bluntly, ignoring facts and evidence—mars both Krauss’s and Slaughter’s critiques (to be clear: Plait does not get the history wrong in his post). In lamenting the persistence of old and false ideas, Krauss propagates an old and false idea. I get bombarded regularly by all sorts of claims, and have become painfully aware that ideas as old as the notion that the Earth is flat never seem to die out completely. Krauss dredges up once again that past when the benighted humans roamed an earth they believed was flat. Unfortunately, there’s no evidence that such a past ever existed. The evidence offers up just three people, three, who claimed the earth was flat (or at least not a sphere): Lactantius—an early Christian author and advisor to Emperor Constantine I, Severian—a fourth-century Bishop of Gabala, and Cosmas Indicopleustes—a sixth-century Byzantine monk. And there is no evidence that their opinions were widely accepted. Instead, the overwhelming vast majority of evidence reveals that people—Christians and pagans alike—believed the earth was a sphere. Most of this evidence provides reasonable philosophical and sometimes empirical arguments for the sphericity of the earth—more than two millennia ago Eratosthenes calculated the circumference of the earth, which circumference scholars continued to cite for the next 1700 years. The evidence does not support the inference that people believed the earth was flat. To be sure, we cannot infer what the uneducated “person on the street” might have believed—that person might have believed the earth was a potato chip—but we can say the evidence supports the conclusion that people argued for a globe-shaped earth. If the evidence reflects contemporary beliefs, then the overwhelming vast majority of people throughout history have believed the earth was a sphere. Yet this flat earth myth persists. 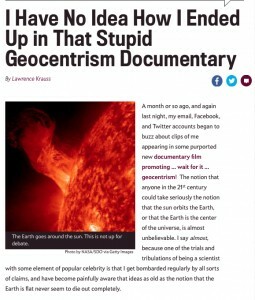 While I might forgive President Obama when he invokes it, it’s harder to forgive purportedly fact-based science journalism for propagating the flat earth story. I find it more regrettable when Krauss repeats it. He rightly lambasts people who propound a geocentric model of the cosmos for ignoring evidence and facts. I would like to see him apply the same standard to his own claims about the past the believed in a flat earth. In both cases evidence and facts demonstrate that these claims—the geocentric model of the cosmos and the flat earth past—are wrong. Krauss didn’t need to invoke history to make his point. But since he did, he should strive to get his facts right. I suppose that’s what bothers me most. Krauss is an expert in cosmology and theoretical physics. His domain of expertise does not extend to history. Just as people invoking cosmology or theoretical physics should consult an expert about about their statements, so too should Krauss consult an expert—in this case, a historian of science—when he invokes history. Slaughter hits all the high points of the Copernican Revolution myth in his attack on a pseudo-documentary. In the 16th century, Nicolaus Copernicus turned the scientific world on its head when he presented a controversial theory: the sun, not the earth, is the centre of our solar system. The church was scandalized. How could God’s greatest creation be under the orbital control of a giant, burning star? Many Protestant scholars blasted Copernicus, saying his writings flew in the face of the Bible. Here we have all the set pieces of the Copernican revolution myth: we see the hero, the revolution, and the villain. As historians of science have long noted and widely discussed (and Thony C. has colorfully pointed out in various posts), the “scientific world” of the 16th century largely ignored or was ignorant of Copernicus’s “controversial theory.” Moreover, the church was not scandalized. Late in the game, the Catholic Church placed Copernicus’s book on the Index, but that was in the 17th century after Galileo and Paolo Foscarini antagonized the Church by challenging its authority (again, see Thony’s post). And the Protestants were some of the earliest supporters of Copernicus’s theory. Slaughter didn’t need to appeal to Copernicus in his criticism of the pseudo-documentary. But since he did, he should get the history right. 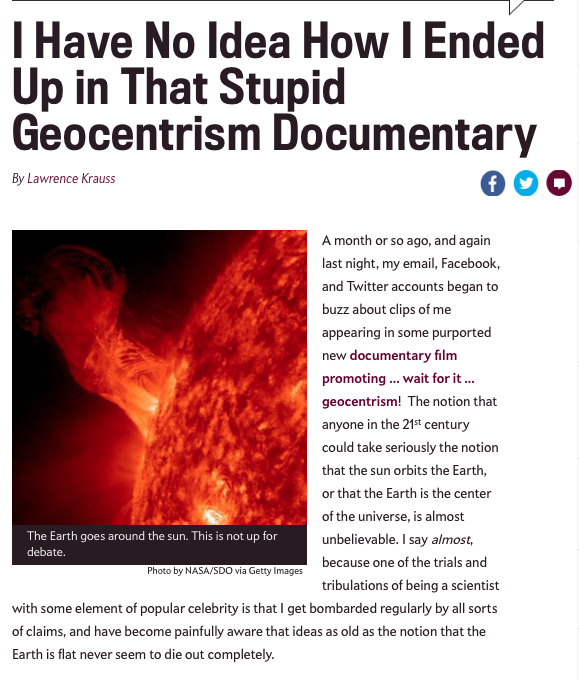 Alas, the history is once again wrong, and wrong in all the same ways that the pseudo-documentary is wrong: both ignore evidence and disregard facts. 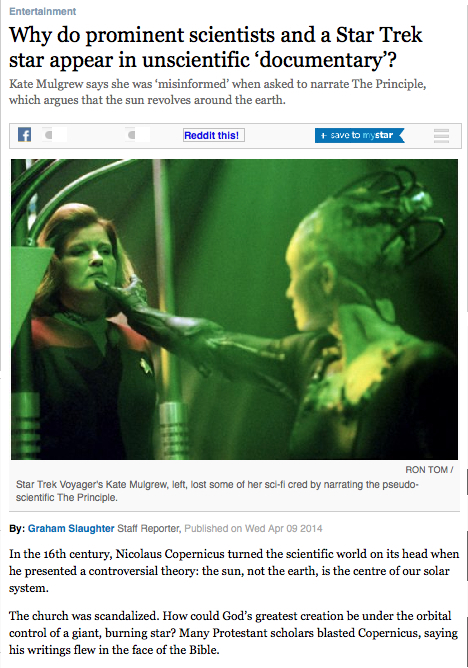 I am not defending the producers of this latest quasi-scientific, geocentric dross or the film itself. I am, instead, calling for greater attention to facts and evidence in our criticisms of such dreck, especially if we are going to assume the moral, factual, and evidential high ground. We can do better.